So it’s somewhere in the 5 o’clock hour on Friday and I’m sitting in my office, watching NFL Network’s coverage of free agency, which is less than an hour away from starting. The rumors are flying hot and heavy, first Nnamdi Asomugha was going to be a Jet, combining with Darrelle Revis to form perhaps the greatest CB tandem ever. That’s not hyperbole, the best CB tandem the league’s ever seen is Mike Hayes and Lester Haynes, the deadly Raiders duo of the mid 80s. Revis/Asomugha would be better. So just great, the rich got ridiculously richer. Then word came the Jets were out of it. Too bad for you Rex Ryan. The front runners were now… the Dallas Cowboys. Ugh. There was even a report of a Jerry and Stephen Jones fist bump. It looked like it was all but a done deal. 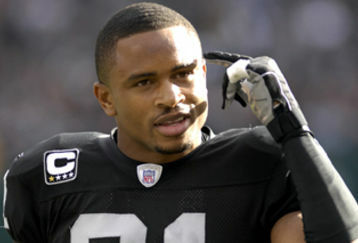 So I was resigned to the fact that Asomugha was going to be a Cowboy. The Eagles, long rumored during the lockout to be a destination, were by all accounts never in discussions with him, and the acquisition of Dominique Rodgers-Cromartie appeared to strengthen the notion that they were done on the CB market. The “aggressive” off-season Lurie said was going to happen that fans expected never happened, because as I wrote the other day, the DRC trade and Babin signing is as aggressive as the Eagles get. Then 6 pm hit. And I was wrong. Wonderfully wrong. Nnamdi Asomugha is an Eagle. I doubt he proclaimed it like Tony Luke did in Invincible, but that would be pretty awesome. When Jeffrey Lurie said the Eagles would be “aggressive” in the off-season, that perked up a lot of ears of fans and media members. The thing is, what the Eagles call aggressive the rest of us call average. This is not a team that regularly splashes a lot of cash on free agents, or makes big trades. The times they have brought in “name” free agents, it’s been to fill positions of dire need. Jon Runyan, Jevon Kearse and Asante Samuel are the only big free agents they have ever signed. Michael Vick is obviously a big name, but he was brought in to be a backup. The Eagles, Steelers, Patriots and Colts are the most stable franchises in the league. All of them have something in common: they build through the draft/trades and use free agency to compliment the roster. For a while the Eagles brought in numerous players who were once very good to great but were clearly past their prime in Jeff Garcia, Blaine Bishop, Antonio Freeman, Dorsey Levens and Levon Kirkland. These guys all had little left in the tank, in Garcia’s case it turns out he had a reserve tank, Reid was trying to squeeze one last useful season out of them and usually did. When the Eagles get Pro-Bowl caliber players, they generally do so by trade. Terrell Owens, Takeo Spikes, Jason Peters, Hugh Douglas, all acquired in trades, all had years ahead of them as productive players. We’re still waiting for those years from Jason Peters though. Today the Eagles were very active on both fronts, albeit with expected moves. For them, that’s being aggressive. They won’t be sorry that you don’t find their moves to be aggressive. Every year in the hours immediately following the draft, teams scramble to sign undrafted free agents. Anticipating they will not be drafted, teams court these players for weeks before the draft, and if a team is looking at a set of say, CBs and there’s a run on CBs late in the draft, they might just call dibs on them with a 7th round pick. Teams generally sign 8-10, maybe more, and except for kickers and punter, they usually they pan out to be nothing more than warm bodies for camp or the 53rd man on the roster for a year. Sometimes though, you get lucky and one turns into a quality player like Stephen Neal or Adewale Ogunleye. Maybe you hit pay dirt and get a James Harrison, Wes Welker or Pat Williams. Perhaps you hit the jackpot and get Kurt Warner or Antonio Gates. But realistically speaking, if you get a season or two out of a UDFA, that’s a pretty good get. In recent years the Eagles have seen Chad Hall, Hank Baskett, Akeem Jordan, Greg Lewis and Reno Mahe have been UDFAs who have made contributions. They’re obviously not game changers, but they’re contributors, which is as good as you can expect from a guy every team passed on for 7 rounds. With that in mind, let’s take a look at the UDFAs the Eagles signed on Tuesday, which got more attention than usual since it happened not in the hours after the draft but as the first thing done since the lockout has been lifted. That’s how starved for real football talk we are, we are excited by the signing of guys not expected to make the roster. But hey, it’s nice to talk real football. Bush is the only the second most disgraced running back in USC history. However, he fits the Eagles’ West Coast offensive scheme quite well. Bush is an excellent pass catching RB, and a quick, agile runner. He could also be used as a primary punt returner, giving DeSean Jackson a little bit of a breather (except against the Giants for psychological reasons). There is simply not enough room on the roster as it currently stands. Shady McCoy is entrenched as the starter, and is a much better running back. With Leonard Weaver and Dion Lewis slated to back up McCoy, where exactly would Bush fit in? Also, recently signed undrafted free agent Noel Devine is a very similar style of player, and that decreases the chances the Eagles make a run at Reggie. Unless the Eagles can justify having a gaggle of RBs on their roster – which seems unlikely – Bush won’t be an Eagle. While the Eagles current corps of WRs are productive and explosive, they are small in stature. Burress would give them an instant upgrade in terms of size. He would provide a tall target in the red zone, a place that Eagles offenses have struggled in for years now. His situation almost mirrors Vick and his decision to sign in Philly: recently released from prison, trying to latch on to an organization where there will not be a lot of pressure to be a major contributor right away. Put Burress on your depth chart as the 4th or 5th WR, use him almost exclusively in goal line situations to start the season, and go from there as he works his way into playing shape. He’s 33 years old, and has been away from the game for two years. Vick also missed two years, but he was younger and could afford to lose some athleticism. Also, Burress has been talking to the Giants about a possible return. For the Eagles, wide receiver is not anywhere near the top of their needs list. It seems more likely that Burress will land somewhere else. Young would instantly be a top NFL backup – a mobile lefty to back up another mobile lefty. Despite his personal issues, he can still be a good player, and had a pretty good season last year until the wheels fell off. Andy Reid has shown a willingness to rehab a guy’s demons, and he’s resurrected both Vick and Jeff Garcia’s careers. His aforementioned personal problems? Lack of work ethic and immaturity. If Haynesworth is in play, having the both of them would be quite a handful. Young is likely not looking to be riding the bench, and will more than likely be seeking a starting gig. He makes sense on a lot of levels if Kevin Kolb is in fact headed elsewhere. If Young is unable to find a starting job on another team, the Eagles might take a chance on him. However, count on Young landing somewhere else where he can compete for a starting job in the preseason. With football back on the front page, we are going to take a look at the Free Agent Class of 2011 from the Eagles’ perspective. Who should they sign? Who should they avoid? And in the end, what is going to happen? We do our best psychic work over the next few days. The Eagles desperately need a corner after having allowed 31 passing TDs last season. Landing the prize free agent in this year’s crop would provide incentive for teams to throw more in the direction of Asante Samuel, who is a premier ball hawk. The yin and yang of Asomugha and Samuel’s styles are perfect: one is a man-to-man lock down corner, the other is a terrific zone ball hawk. If the Eagles get Dominique Rodgers-Cromartie in a Kevin Kolb trade with Arizona, they can cover spread offenses with three of the best in the game. Of course, if they get DRC, they probably don’t go after a corner… but why not go for broke, similar to what the baseball team across the parking lot has done with their Starting Rotation of Dreams? Asomugha comes with a prohibitive cost against the salary cap. He will probably cost big money, likely 14-17 million dollars a year. Investing a lot in Asomugha might lead to sacrifice elsewhere at other need positions, and that is not the way the Eagles usually do business. That money would be better spent getting a corner like Johnathan Joseph or even Ike Taylor along with players at other need positions. Asomugha is coming off a contract that just paid him $30 million over 2 years. If this is truly about the money, he will sign elsewhere. Unlikely. Asomugha will likely be offered more money by other teams than the Eagles are willing to offer, especially if they can land Rodgers-Cromartie in a trade with Arizona. The Eagles haven’t really found the answer on the defensive line on the other side of Trent Cole. Ray Edwards could be that guy. He played on one of the best defensive lines last year in Minnesota and tallied 8.5 sacks. The Eagles can’t be sure with the progress of second-year player Brandon Graham. He played well in his rookie year until going down late in the year with a torn ACL, leading to microfracture surgery in the offseason. Edwards would immediately solidify the other side of the line, and would not come with as steep a price tag as Asomugha. The Eagles could likely afford both Edwards and another corner from the free agent pool for the same cost. Edwards could be considered the defensive version of Alvin Harper: a player who clearly benefits from the talent around him. He was clearly the least important person on the Vikings’ defensive line and might not benefit by being more of a focused target for offensive lines. Meanwhile, Trent Cole is locked in under contract, and Brandon Graham is still acclimating to the system. Darryl Tapp is still in play as a free agent-to-be, but according to a recent tweet, Tapp had a meeting with new DL coach Jim Washburn and was excited to work with him. If the Eagles had no intention of keeping him, that meeting probably doesn’t happen. So with a rotation of three established DEs, is there really room for a player like Edwards? According to the Atlanta Journal-Constitution, Edwards is likely going to be an Eagle when all is said and done. Of course, Atlanta resident AndDave claims, “I don’t even use the AJC as toilet paper.” The Eagles have never been a “go for broke” team, and have only added marquee names at positions where they have been remarkably thin over the years. By those standards, we expect Edwards will not be wearing midnight green in the 2011 season. Most of the same statements that apply to Edwards could apply to Charles Johnson. Of course, Johnson is coming off his breakout year with 11.5 sacks anchoring a Panthers defensive line trying to overcome the loss of Julius Peppers. Johnson was the featured pass rusher for Carolina, and made the Panthers defense quite respectable despite their poor record. See the section above on Edwards. Johnson falls into the same mold of the type of player the Eagles usually don’t go after if they already have established men at the position. There will undoubtedly be a bidding war for players like Johnson, as teams throughout the league try to stock up on pass rushers. Johnson is one of the bigger names with some of the bigger numbers out there, and the Eagles will likely be outbid for his services. A post on Twitter from beat writer Jeff McLane claims that Posluszny would love to join the Eagles linebacking corps. He is coming off a season where he led the Bills in tackles with 103, and also managed 2 sacks. He can play both inside or outside, and the Eagles love versatile defensive players. Adding Posluszny to a rotation that could also include Stewart Bradley and promising youngster Jamar Chaney would be a nice upgrade. With the abundance of spread offenses in the league, usually only 2 LBs are on the field at any given time, meaning that all three would get reps.
Posluszny has stated publicly that his preference is to return to Buffalo, but will test the open market in the days to come. He has missed time due to injury the past two seasons, which doesn’t bode well for a 27-year old linebacker. This could be his only chance to cash in on a lucrative free agent deal. Plus, the Bills will have to reach the new salary cap floor, which amounts to 99% of the cap. That could force Buffalo’s hand into offering him a large sum of money. Posluszny would be more of a complementary player in Philly rather than the “big fish” he is on the Buffalo defense, and the former Penn State standout would be a great fit. However, Buffalo needs his presence more than other teams do, including the Eagles. Buffalo will do what they can to re-sign him to anchor their defense. The best cornerback on the market with a pronouncable name. Although, the extra “h” in his first name still makes it difficult to spell. He was a shutdown corner on a team that needed a strong defensive presence. Joseph is younger than Asomugha at age 27, meaning he is under the Eagles unofficial age limit of 30. With 14 INTs over his five year career, he can be counted on to give Asante Samuel some competition in the turnover department. He also brings the big play ability, having scored a touchdown himself for each of the past four seasons. Plus, pretty much everyone on the Bengals is chomping at the bit to get the hell out of there. Joseph comes with a lot of injury baggage, having missed 12 games over the last 3 seasons with various ailments. With the new rules in the CBA, the Bengals (like the Bills with Posluszny) will have to reach the salary cap floor of 99%. Cincinnati will likely make re-signing Joseph a priority, and will probably offer him a good amount of money to stick around. Most importantly, Joseph will not move until Asomugha moves, and the teams that lose out on Nnamdi will add fuel to the bidding war. If the Eagles do not get Dominique Rodgers-Cromartie from the Cardinals, they will probably make a very respectable offer to Joseph. Taylor has been a constant presence on one of the top defenses in the league year after year. He has not missed a game over the last 6 seasons. Despite numerous changes in the Steelers secondary over the years, he has remained in the starting lineup, which says something about how much he is valued. At 6’1″, he would be better suited to covering some of the league’s taller receivers opposite the 5’8″ Asante Samuel. Taylor is 31, a little bit older than the Eagles would like. He is not as much of a threat for INTs, with only 11 in his 8-year career. He can choose to remain in Pittsburgh in Troy Polamalu’s shadow, and still be productive in that defensive scheme. Again, if the Eagles don’t get Rodgers-Cromartie, they will still need a CB. Obviously, their preference would be for Asomugha or Joseph, and would only move to Taylor if they fail on all 3 of those fronts. Taylor wants to stay in Pittsburgh, and they want him back. It seems unlikely he even reaches the Eagles radar screen. Haynesworth would provide a great test for new defensive line coach Jim Washburn. He honestly believes he can coach him to a return to his Pro Bowl form of 2007-2008 when he was with Tennessee. Haynesworth would excel in the Eagles 4-man front as a run stopper. Plus, he’ll get to face the Redskins twice a year for some extra motivation. We all know that Haynesworth was not motivated last year. Observe: Exhibit A. He even made Mike McGlynn look like a Pro Bowl offensive lineman. The lingering question remains: was his poor attitude a product of the toxic environment in Washington, or does it reflect a deeper character flaw? If the Eagles offer him a contract, they will undoubtedly take his character questions into consideration. The contract will likely be incentive based with provisions that will allow the Eagles to back out if the attitude adjustment fails. If he agrees to sign with the Eagles, he will definitely be happier for doing so. Tomorrow, we take a look on the offensive side of the ball. And don’t worry… we promise this will be a Favre-free zone. The NFL is days away from ending its lockout. *breathes a sigh of relief* No, wait, what’s that you say? It’s not? FML. Jeffrey Lurie says that once the league is open for business, they’ll be aggressive. I’d like to believe him, and writers all over the country do, but need I remind you that an aggressive off-season isn’t the way the Eagles normally do business? Perhaps this season is different though. The rise from the ashes return that Mike Vick has made gives the Eagles a deadly offense. The defense is only a couple of upgrades away from being solid. This team isn’t far from being a legit Super Bowl contender. So that has people thinking they’ll be active players. Nnamdi Asomugha wants you to stop a moment and think about this. What will the Eagles roster look like once free agency hits and trades are to be made? Where can the Eagles be aggressive? Where can they even be aggressive? Let’s take a look. A realistic look. In other words, don’t get too excited. They’ll wind up being as awful as the movie. In the wake of jettisoning 12 players and importing 7, no one really knows what exactly the Flyers will look like next year. They are unquestionably better in goal and worse up front. It would be great if Brayden Schenn is a Calder Trophy candidate. Perhaps the click that Claude Giroux and James van Riemsdyk found between each other against Buffalo in the playoffs finds itself again all season long, similar to the evolution of the Hartnell-Briere-Leino line. Hopefully the gamble on the 39 year old Jaromir Jagr really pays off. Maybe Jakub Voracek shrugs off the laziness that dogged him in Columbus and breaks out. And hopefully having no returning intact forward lines isn’t an issue as the defense, which will be without Chris Pronger to start the season, sorts itself out. That’s a lot of uncertainty for a team with Cup aspirations. One thing that is certain is that the Flyers are going to be terrible at face-offs.